At this point in time Alex Bell is quickly becoming my favourite young adult writer. I have previously reviewed Frozen Charlotte, a story of murderous freaky china dolls and liked it. 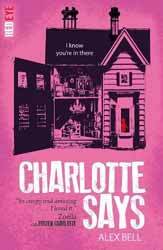 Her new novel, Charlotte Says, (2017, 219 pages) is a prequel and explains how the dolls found themselves plastered into a wall of a basement. Her ability to imbue these inanimate objects with pure evil is such that I found I just had to look them up and they really do exist, however after reading Bell’s books I would avoid having them in the house. The novel tells the story of seventeen-year-old Jemima who travels the remote Isle of Skye to take up an assistant teaching job. She carries with her a secret revolving around the tragic fire which killed her mother. At the beginning of the novel we know as much about the tragedy which killed her mother and burned her house down as Jemima does. She cannot recall the events of that night only that she had argued with her step-father. She chooses Skye partly to get away from the mystery of her missing memories, but mostly because her friend Henry also works at the school. For anyone who read her previous novel Frozen Charlotte you know that you are in the realms of creepy and malevolent china dolls. For the horror aficionados there is some blood, even a bit of demonic possession and a child’s eyes having pins stuck in them, but these incidents are few and are not really the strength of the book. The book overwhelmingly succeeds in creeping the reader out, this is not a book to be read alone or you’ll find yourself constantly looking over your shoulder. It does for china dolls what Stephen King’s IT did for clowns, subverting what should be an innocuous and loveable object to children into a source of fear and terror. The book is told in two time periods. In the present Jemima reunites with her young love Henry, but she is unsure about getting too close to him as she fears that she may in some way be responsible for both the fire and deaths. She also becomes acquainted with the school headmistress, the beautifully twisted Miss Grayson, a woman of such unpleasantness that the story keeps you guessing as to whether she has been taken over by a demon or is just batshit crazy. What happened on the fateful night is slowly revealed through the novel, explaining just how and where the dolls came into existence. Bell has demonstrated a real skill as a young adult author. The more graphic elements of the novel are few and Bell uses the story to continually add to the tension. I must admit that I could find nothing of fault in either the characterisation of the skill with which Bell is able to translate the peril they face. Overall, I thought that this was a near perfect novel and should be able to bridge the age groups in much the same way as the Harry Potter books.